In one of the training on results-based management, monitoring and evaluation I conducted for the GREAT Women Project of the Philippine Commission on Women, I met one extraordinary woman entrepreneur by the name of Fe Buangin Carranza, 50, a polio victim since the age of 3, who has been awarded 2011 Outstanding Micro-entrepreneur of Naga City. I conducted the training on monitoring and evaluation for the Metro Naga Development Council on March 28-30, 2012 at the Avenue Square Hotel in Naga City. On the weekend after the training I decided to visit this outstanding lady entrepreneur of Naga City. Fe Carranza at one time was president of the persons with disabilities in Panicuason, Naga City. One time when she was bringing some goods to employees of the city hall of Naga, Atty. Leni Robredo, wife of former Naga City Mayor Jesse Robredo, who was then the president of the Naga City Council of Women (NCCW), took notice of how Fe started the engine of her motor tricycle, that is, by kicking the starter with her left foot so that she is facing the back of the motorcycle. This is because her right foot was the one stricken with polio. That was the story of NCCW’s facilitating support from the Department of Science and Technology (DOST) to provide her with technical assistance for her soya production. Fe’s soya production started simply in 2004 when some college students from Infanta, Quezon did some study visit in Panicuason but got stranded by a typhoon. The students came to her house and asked to stay for a while until the typhoon had passed. In gratitude one of those students who knew how to make tofu or “tokwa”, taught her how to prepare soya beans in making tofu. With the new skill that she has learned from those students she began a tofu business. 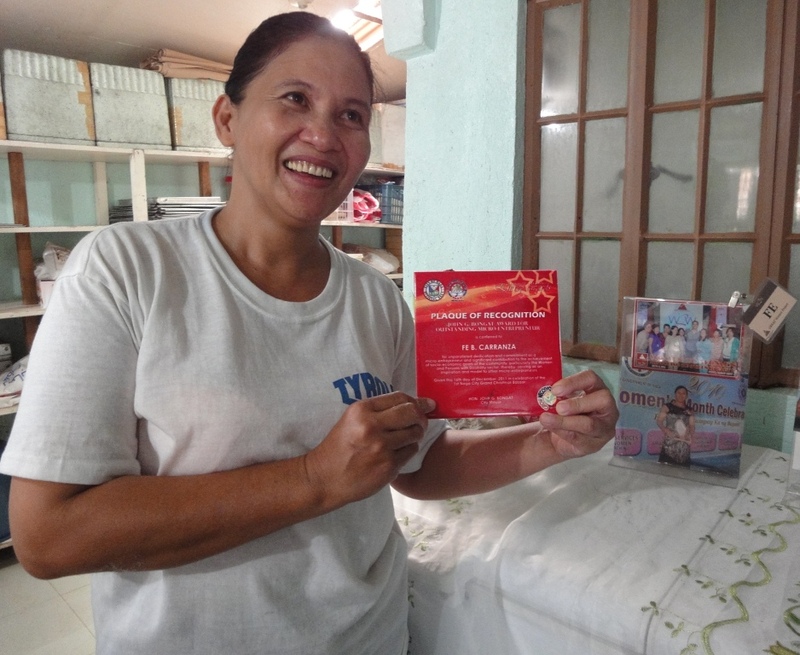 The Grow Negosyo program of the Naga City local government was also instrumental for the success of Fe’s food business by facilitating technical skills and linking her to potential clients. Today she is now supplying soya bread and chilled “taho” to some 29 schools in Naga City under a contract with the Naga City Local School Board, and in 27 Barangay Day Care through a contract with the City Nutrition Council. She has generated jobs for more than ten workers by her micro-enterprise which she named FABCARR Food products – the acronym for her name. Aside from nutritious soya bread and chilled taho, FABCARR also produces soya milk, soya choco, soya coffee, tofu, and a soya beans-based vegetable meat called soya ham. Prior to her Soya food production business, Mrs. Fe Carranza, who finished only high school, engaged in a buy-and-sell business in Navotas, Metro Manila, as a wholesaler of vegetables and maintaining a small stall in a private market. Unfortunately with her absence at home her husband, who was a driver for a Filipino-Chinese businessman, had strayed for a while, and so she decided to go back to Panicuason to take care of her four children and to rebuild her family from the setback caused by her estranged relationship with her husband. That was how she got involved with the PWD of Panicuason and then the tofu making prior to the DOST. The DOST assisted Fe to put up the FABCARR Food Products in 2011. Then the NCCW linked her up with the local school board, as well as with the nutrition council of Naga City. When her soya production picked up she asked her estranged husband to get back home to lend a hand. Her husband’s employer would not let go of him though and even increased his salary, but in the end he was able to negotiate with his employer for an on-call basis arrangement. Now Fe’s husband is happily assisting her in the business. In 2010 Fe was awarded as the happiest Nagaeña or resident of Naga City by the NCCW. Today she is being nominated as the happiest Filipino by the Metro Naga Development Council. Philip Emmanuel C. Peñaflor, is an independent monitoring and evaluation consultant, currently assisting the GREAT Women Project of the Philippine Commission on Women (philip.penaflor@gmail.com).